Excellent Source: choline. Good Source: protein. Place eggs in saucepan large enough to hold them in a single layer. Add cold water to cover eggs by 1- inch. Heat over high heat just to boiling. Remove from burner. Cover pan. Let eggs stand in hot water about 12 minutes for large eggs (9 minutes for medium eggs; 15 minutes for extra large eggs). Drain immediately and serve warm. Or, cool completely under cold running water or in bowl of ice water; then refrigerate. This harmless but unsightly discoloration that sometimes forms around hard-boiled yolks results from a reaction between sulfur in the egg white and iron in the yolk. It occurs when eggs have been cooked for too long or at too high a temperature. Our method - cooking eggs in hot, not boiling water, then cooling immediately - minimizes the greenish ring from appearing. Piercing shells before cooking is not recommended. If not sterile, the piercer or needle can introduce bacteria into the egg. Also, piercing creates hairline cracks in the shell, through which bacteria can enter after cooking. Never microwave eggs in shells! Steam builds up too quickly inside and eggs are likely to explode. Very fresh eggs can be difficult to peel. To ensure easily peeled eggs, buy and refrigerate them a week to 10 days in advance of cooking. This brief "breather" allows the eggs time to take in air, which helps separate the membranes from the shell. Hard boiled eggs are easiest to peel right after cooling. Cooling causes the egg to contract slightly in the shell. Gently tap egg on countertop until shell is finely crackled all over. Roll egg between hands to loosen shell. Starting peeling at large end, holding egg under cold running water to help ease the shell off. 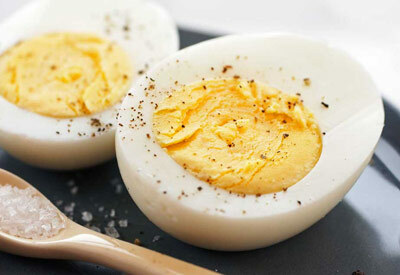 In the shell, hard boiled eggs can be refrigerated safely up to one week. Refrigerate in their original carton to prevent odor absorption. Once peeled, eggs should be eaten that day. It's almost impossible to hard-cook eggs above 10,000 feet. Save $2.00 on ONE Tide PODS (excludes Tide Liquid/Powder Laundry Detergent, Tide Simply, Tide Simply PODS, and Tide PODS 9 ct and below, and trial/travel size).